Cris Kistler, Santa, Becky Stevens, Kathy Carr, Tracy Speigle and Charissa Zon presented the check to Ken Locke for the Kosciusko County Salvation Army’s Angel Tree. 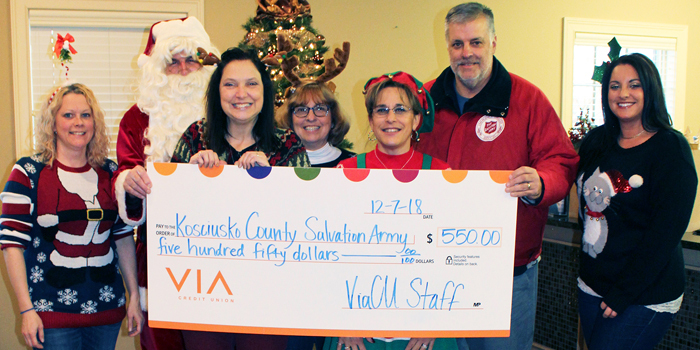 KOSCIUSKO — Via Credit Union’s staff came together once again this year to support the needs of the community by raising $550 for the Salvation Army Angel Tree program, which provides gifts to children in need. “No matter what the cause, ViaCU staff is always willing and able to open their hearts and help those in need,” said President and CEO Dave Abernathy.